Mr. Cohab read a study contending that Swedish news (papers, radio, television) always only report on the bad, bad stuff that takes place on midsummer eve, such as road accidents, fightings, disorderly drunkenness, rainy weather, overturned midsummer poles, ankles sprained in lame attempts at imitating leaping frogs, and so on, rather than focusing on the truly festive part of the midsummer eve festivities. So I’m here to report that midsummer eve was indeed a rainy affair. And because of that, it was also a very energizing affair. At least as far as Mr. Cohab and I were concerned, since we made a visit to Nordens Ark* (in the vicinity of Lysekil). Explanation: At first the sun shone prettily, inviting kids and parents to the national reserve park, running around and yelling their heads off, thus scaring the wildlife away. But soon the rain started falling and the yellers made a beeline for the exit. And suddenly Mr. Cohab and I were blessed with a gradually increasing number of spottings of almost all of the shy animals in the park. Thusly, we admired wolves, Pallas’s cats, Persian leopards, snow leopards, Amur tigers, lynxes, eagle owles, Ural owles, Przewalski’s horses and wolverines (i.e. 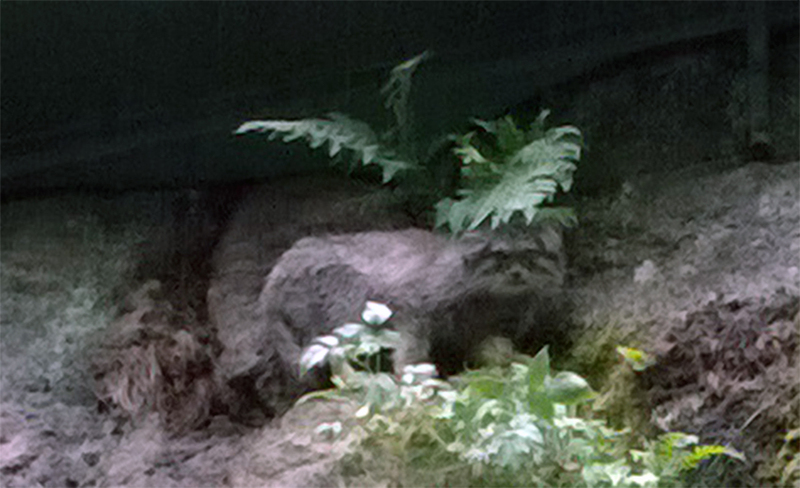 not only the extremely shy shadow of a single wolverine but the full and furry flesh and body of several individuals). One of the wolverines even decided to show us a silly game of grabbing its own paws and tumbling around in the grass, snapping at flowers and flies, before finally scuttling off up a tree. Out of sight, but not out of mind. These two Amur tigers were also playing in a leisurely manner before hearing the rumble of an approaching fourwheeler associated with feeding time. This is why their ears are pricked and their attention is turned up the hill. 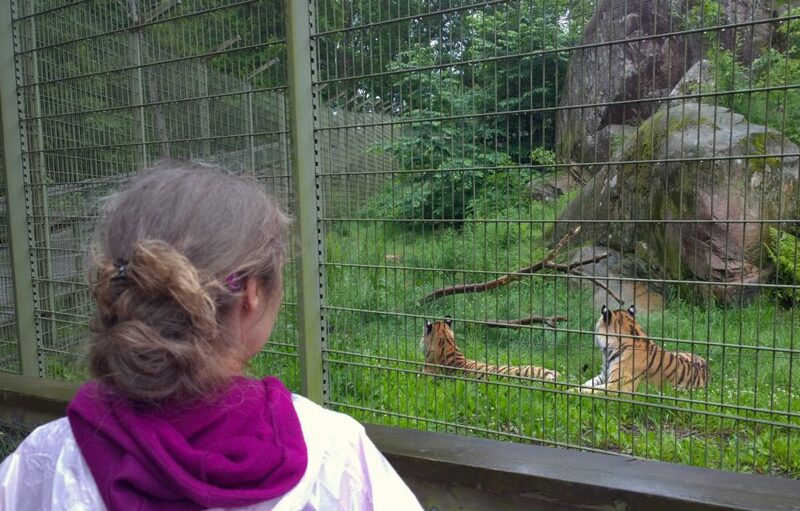 The ranger on the fourwheeler told us that sometimes the tigers are so excited by the vehicle that they jump at the fence. This time, however, they could not be bothered to show off their acrobatics. They simply yawned and made tiger meows and chewed on some straws of grass, looking lazy and beautiful. Even so, to me the most endearing resident at the park was this Pallas’s cat, who managed to climb a slippery wet and almost perpendicular mountain side while looking down on us with a nosy sort of grumpiness. I love grumpy cats. I simply love them. The cat was high up and the distance was great, but Mr. Cohab managed a discernible snapshot. *Nordens Ark is doing important work for the preservation of endangered species, and the park itself is beautifully located and also equipped with a big children’s playground, not to mention quite a large section of lovable farmyard animals. Do pay them a visit!